Our Supreme Security Cheques incorporate features to provide a high level of protection against fraudulent activity! 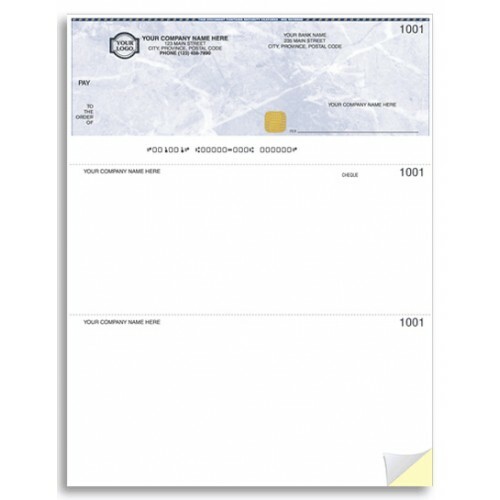 All Supreme Security features are listed on the back of our cheques! Fibres & Security Ink - Coloured fibres on front are visible only under black light. Security Screen - "ORIGINAL DOCUMENT" text & weave pattern visible on back. LineMark Paper - Patented fibre disruption process. Chemical Protection - Special chemical indicators in the paper appear as stains if exposed to common ink solvents. TonerFuse Coating - Anchors dry toner images to resist alteration. 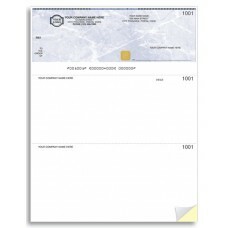 HOLOGRAM - Multicolour reflective marker fused to each cheque. Our Supreme Security Cheques incorporate features to provide a high level of protection against frau..